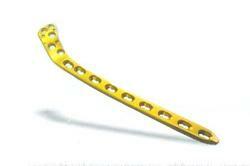 Our product range includes a wide range of locking proximal lateral tibial plate and locking distal tibial plate. Our organization is involved in offering a wide range of Locking Proximal Lateral Tibial Plate which is designed in conformation with international quality standards. These plates are demanded in hospitals, surgical units and orthopaedic clinics for various applications. To fulfil the diverse requirements of our prestigious clients, we are offering these plates in different sizes such as small, narrow and broad plates for different screw types at the most competitive price. Banking on the skills of our qualified team of professionals, we are instrumental in offering excellent quality range of Locking Distal Tibial Plate. This Locking Distal Tibial Plate is highly appreciated amongst customers for its excellent application in medical field. Our product range is checked under various set quality parameters.